All Bicycles will pay the consignee (owner) all monies owed on the last business day of the month that the sale was completed. All monies collected by All Bicycles over and above the agreed amount shall become All Bicycle profit. The consignee (owner) must sign in person for payment, under no conditions may another party sign for payment. Rich tries to get you exactly what you want and need, but if it's not right here's how it gets handled. If you are not fully satisfied for any reason, you may return the item for a full refund within 10 days of purchase. Bicycles must be in showroom condition (subject to Rich's approval). The refund will be issued in the same form as the original payment, for credit/debit card returns the exact card must be present. Cash or credit/debit purchases over $250 will be refunded in the form of a mailed check within 10 business days of return. Special orders are subject to a 25% restocking fee. Store credits valid for 90 days. Deposits are forfeited after 30 days. Sorry, labor fees / charges are not refundable. Things happen, if you received something damaged or defective Rich will try to make it right. Rich will be happy to handle your warranty for products purchased at All Bicycles. Please be aware processing time may vary depending on the manufacturer or vendor and that some vendor restrictions apply. 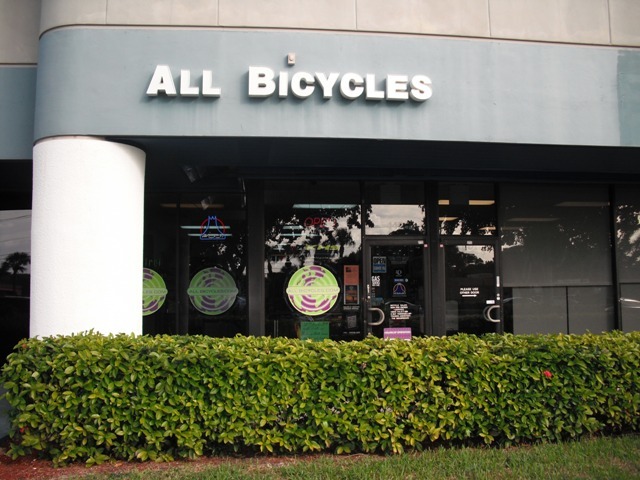 Rich Cohen / All Bicycles values and respects your privacy. We do not and will not sell or rent our customer lists & information including names, phone numbers and e-mail address.